around there, it's pretty small." governments are the product of flawed nineteenth-century thinking and a bureaucratic urge for centralized control, says a C.D. Howe Institute Commentary published today. What’s more, says the study, smaller and more flexible jurisdictions can often deliver services to residents at lower cost, throwing in doubt the financial assumptions typically used to defend amalgamations. The new study, “Local Government Amalgamations: Discredited Nineteenth-Century Ideals Alive in the Twenty-First,” argues that some provincial governments have been guided by an intellectual fashion of the nineteenth century: an apparently unshakable faith in monolithic organizations and central control. The study’s author, Robert L. Bish, Professor Emeritus at the University of Victoria, explains that this flawed thinking is unlikely to suit the rapid change and the need for institutional adaptability that will characterize the twenty-first century. Meanwhile, large and centralized governments will be further removed from their voters, and less able to respond effectively to local needs and choices. extensive review of scholarly research since the 1960s demonstrates that the background assumption that smaller and more numerous jurisdictions provide services at high cost is typically wrong. Small municipalities contract for services with their neighbors, private suppliers, or other providers when it is cost effective to do so, and provide services themselves when that is less costly. In each case, the decision is based on what is technically efficient in specific lines of activity and depends on close familiarity with local conditions. Because distant mega-councils have less information on which to base decisions than do councils closer to their voters, the cost savings that provinces hope to deliver through amalgamation often prove illusory, and services are thus less likely to match voters’ wants and willingness to pay. claim that overall costs per capita for taxpayers are lower with larger urban government units. costly than governments typified by multiple government units. area has more than 225. Regrettably, what none of the advocates of consolidation do is to look at the actual data. York, as the largest consolidated government in the United States, would have government expenditures per capita that are among the lowest. But not so, they are among the highest. stretch through the parts of four provinces. The Milan area has more than 150 cities. harder for the citizenry to control. It is clear that the most efficient city size is not large, but is rather no larger than middle-sized. Auckland Restructure - where's the "thought leadership"...? I am struggling to find any “thought-leadership” that supports Government restructuring proposals for Auckland local governance. That makes it very hard to accept, and difficult to engage with. The “Making Auckland Greater” document which accompanied Cabinet decisions two or three weeks ago, had been worked on for a good while longer than appearances suggested. It looked as if Cabinet had cooked up its “response” to the Royal Commission’s reports in a week. But now I hear through the grapevine that senior officials in the Department of Internal Affairs (DIA) had working on a Government response for much longer. So. The Government’s response is not a reaction to the Royal Commission at all. It is its own decision. There have been enough statements from enough politicians to the effect that restructuring will not produce savings of any consequence. Some may still be arguing that there will be savings, but the consensus is that savings will be minimal. The consensus is also that Auckland governance restructuring will cost money. So the question has to be asked: what are we doing, and why. Summer sunset at Timaru. I liked the triangle. And I'm fascinated how mature gum trees in silhouette can look exactly like a handful of dry weeds held closeup. I have to assume that what is being proposed is based on Government’s strategy for Auckland. 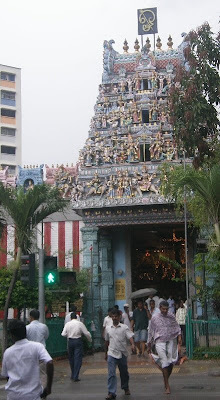 It is intended to give effect to an incoming Government’s principles. But what are they? What is Government’s plan for Auckland? It is always difficult to second guess this stuff, but if – as seems likely – there I serious policy work being done in the DIA – then they will have considered what is happening around the world on this. How cities need to be governed, or self-governed, to best engage with and respond to global forces. So I had a bit of hunt through Google on this. From this we can glean that for centuries the world economy has shaped the life and development of cities. Now we seem to be in an age where this effect is more profound than it has been. Or at least that is the case in the age of globalisation. This was the age of global flows: flows of money, flows of information, flows of technology. We can see case studies of cities that have very deliberately positioned themselves to benefit from these flows. 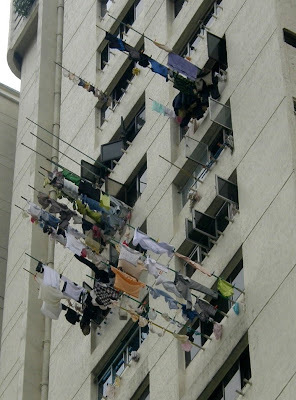 Dubai is an extreme example. On the other hand, every country, and every city has its own history and its own geo-political position. Google wisdom suggests that there is a very clear need to manage these two realities. Also there is a need to recognise that local realities, or local differences, have a strategic value and add edge to what a city has to offer. The converse of this is that the city that sells its soul as it strives to be all things to all global investors, can profoundly damage that city’s future. Political fragmentation is not an especially positive word for what others would describe as local decision-making, local accountability, democracy. Theorists describe it is as public choice. They argue that a modern metropolitan area should contain multiple political jurisdictions, and that these will enhance choice (people choosing where they live in a city based on the character and the cost of an area), and they will enhance efficiency in service delivery (because not everybody wants the same services delivered to the same quality in all areas.) There is a market of local governments where mobile ‘citizens’ shop around for ‘communities’ that best fit their preferences. The Government’s proposals for Auckland amount to regionalism. Political theorists argue that political fragmentation of a metropolitan area makes it difficult to streamline economic development, to provide regional services, or to enable the expression of a regional voice. These theorists advocate for one single voice. Consolidationists therefore argue that regional government is the solution. That is what Government is arguing, without being clear what it’s doing and why. Getting a city on board globalisation - and the global investment trail - is often associated with moves to regionalise local government. This is also a conversation about centralisation vs de-centralisation. Some thinkers argue that decentralisation can work as long as there is a constant dialogue across jurisdictions regarding the urban problems that affect everyone in a metropolitan area. The Government’s proposals for Auckland amount to extreme decentralisation – in the form of an all powerful Auckland Council, with a fig-leaf of local government - in the form of community boards which are actually a functional part of Auckland Council. A very big and muscular right arm, and a small and weak left arm, but both driven by one body corporate. It’s all about regionalism. It is not about local government. This is all a bit disturbing. Suggesting that Government's plan for Auckland governance is driven by Auckland becoming much more entrepreneur/developer friendly. Of course we still don’t know who has actaually provided the basic policy thinking behind what Government is doing. I don’t know anyway. But the above does give a flavour. Rings true. It is the sort of thing that might appeal to Rodney. The problem with it all though, is that the collapse of the global property and real estate development finance industry, has destroyed much of the drive for globalisation. It was a house of cards. Look at Dubai. Fast sinking below the desert sands. And there are many other such projects. Look at the IMF - wondering where its future might best lie now. So why should Auckland’s governance be re-shaped for a future that is no longer credible, by thinking that has passed its sell-by date? And if there are other economic theories that underpin Governments’ project for Auckland, let us all share in their wisdom. C'mon Rodney, open that kimono, show us what you've got! Well. I don't want to get your - or my - hopes up too much with that headline. But the Regional 3 Water Strategy document completed in the last few months is hopeful. It was presented to the Auckland Regional Sustainable Development Forum meeting last Friday. period (To be confirmed by cost benefit analysis). through the joint planning and implementation of integrated solutions for the delivery of water supply, wastewater and stormwater services and develop an equitable basis of sharing the benefits achieved......"
Having fought Watercare hard over its wasteful and expensive track-record of building large projects and over-emphasising "supply management" instead or - or at the expense of "demand management", and of the financial benefits of deferring capital expenditure through more careful use of existing resources, and of the ability to re-use treated wastewater for non-potable purposes, and of the need to be talking about "integrated management", I am satisfied that these words now take their place strongly in these 10 summary points. The cynic in me wonders how much this document and its content played in persuading the Royal Commission and now Government to support vertical integration of at the least the 2 charged for waters - water supply and wastewater. Still. The document exists now and has some regional traction, so it's important that Watercare and the other water operators deliver it. This was the graph in the presentation I liked best. 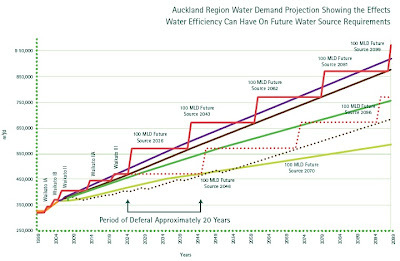 Basically it shows the demand/supply line (the deep blue line) for water from Auckland over the next 100 years from 1999. This line is based on current practices - ie if people want more water we'll just keep on pumping it up from the Waikato (at great cost for treatment and pumping). The red step line shows chunks of new supply being built and brought on stream. What is really interesting now, are the two dotted lines. The lower dotted black line shows the demand pattern that is now being aimed at through building a big hunk of "demand management" into the strategic plan. And the dotted brown one shows the delay that change in fresh water supply demand will trigger in bringing on new supply. So it's all very interesting. Even though it's a regional strategy, there is some effort made in the document to look at the matter of stomrwater. There's even mention in there of the need to ensure Low Impact Urban Development approaches to handling the issue of stormwater run-off. That's also good. You might like to check these documents out yourself. You can see them at: Watercare Click on the links that take you to the 3 Water Strategy documents. Some of these are chunky pdf's but good information. 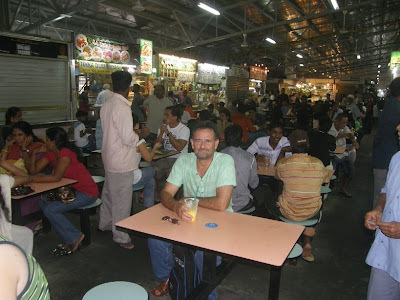 Here I am, drinking my Lassi in the Tekka Market of the Little India precinct in Singapore. Time out from the City Development conference. 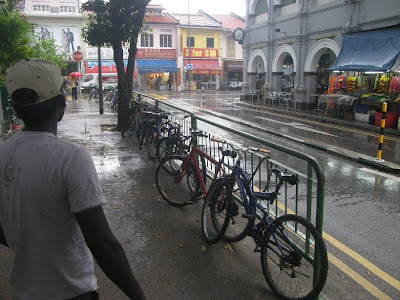 Actually I was escaping a tropical downpour. A fantastic electrical storm outside. Lightning about every 30 seconds and the most violent claps of thunder. The market roof was metal. Every crash the whole place shook, and everyone banged their tables...! 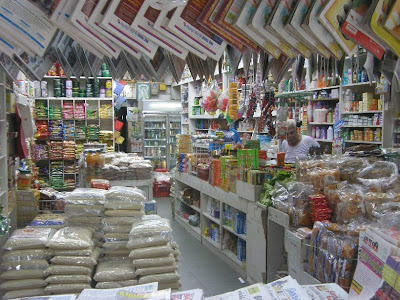 And the shops were as you would expect, and hope for. An eye feast. Made me yearn for Auckland to give more attention to the multi-cultural city we have, and make more of it. Just as the storm struck, everybody looked around for a place to go and sit or stand it out. Was all very quick. Great street scapes. Protected by strong town plans I am sure. 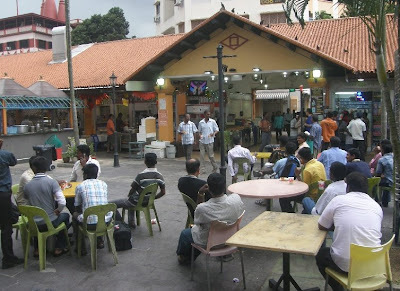 This environment is an asset for Singapore, and strongly features in maps for tourists like me. I didn't spend much money, but I took a heap of photos. There was something about this street corner that I liked. It's the signs, the colour, the wall finishings, and the vibrancy of traffic. Sometimes cars and their movement - provided there are lights and pedestrian crossings to slow it down - add to tne energy of a street. But there are other corners where there are no cars. Quiet corners to sit and chat. With gods nearby. Stree furniture and window shutters and cinema hoardings to decorate the scene. None of this happens by accident. All by design. There is much attention to detail here. 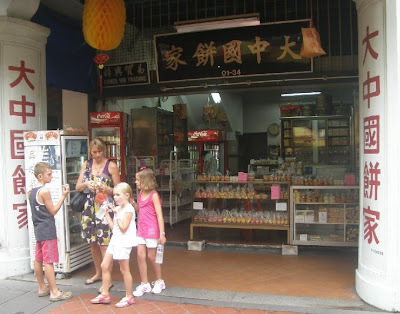 Here, mum buys the kids some Chinese sweets and ice-creams from the local sweet shop. Plenty of other bits and pieces to buy too. 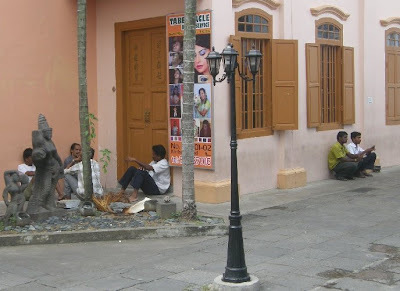 Great places to sit - with the climatic conditions well provided for. Heat of the sun and torrential downpours alternate. Lot of style. I liked the chinese laundry effect. Boy - a lot of people live out this way. 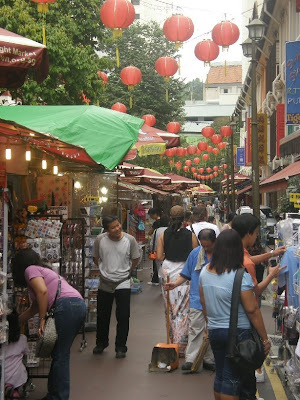 This is Chinatown. 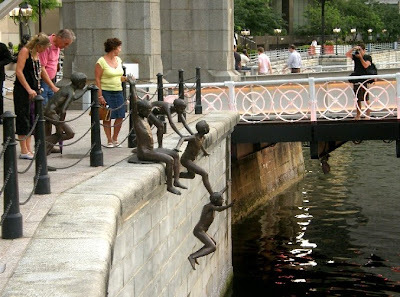 A very people-oriented public space. No cars here - even though this is a very car-oriented city. Cars have their place - but there are also rigorously protected areas for people. 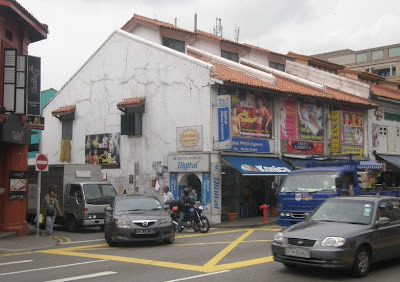 Auckland could learn a lot about vehicular delineation from Singapore. 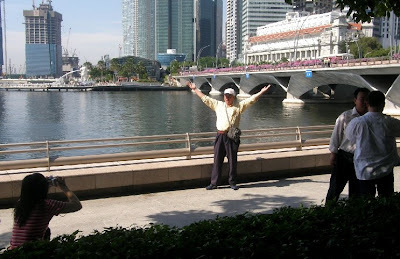 The heritage building in the background is the Fullerton Hotel. As you can see, it's located in the foreground of a number of vast new tower buildings. But sufficiently alone that it is not dominated by them. Visitors to the waterfront love it. Most of the photos taken have it in the background. The favorite pose is to appear to be "lifting it". This is part of the garden on top of one of the waterfront developments described in the previous blog. You can see a fountain. Little garden squares. Paving. Seating. And trees to shelter you from the merciless heat of the tropics. In the mid-background is the top of a light well used to bring natural light to two levels below. 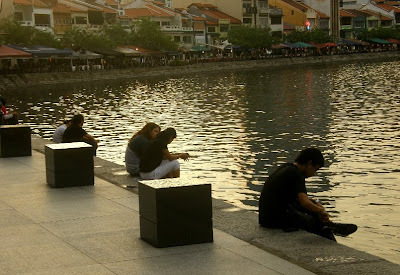 ... as here, where people love to sit dangling their legs and feet above the water. In the background is a popular restaurant area. 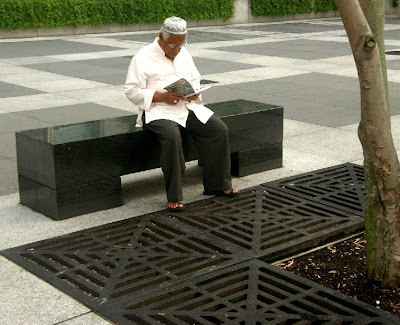 The polished black basalt (I think) blocks make good seats. The quality of public open space finish is exemplary. Even Baron Haussmann (the destroyer and rebuilder of heritage Paris) would be impressed to see his ideas for tree root planting and protection, public seating, and paving done with so much style and attention to detail. 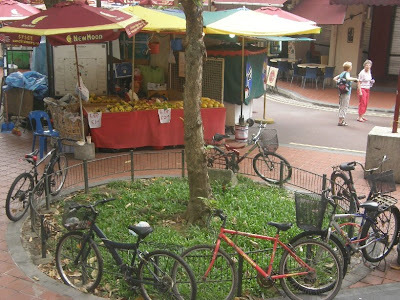 And what really strikes you, coming to Singapore from the Auckland waterfront, is the total absence of cars. And the piece and quiet and sense of calm that goes with that determination to exclude the motor vehicle from the waterfront. A few weeks ago I was fortunate to be invited to make a couple of presentations to the Annual Marcus Evans City Development Conference. 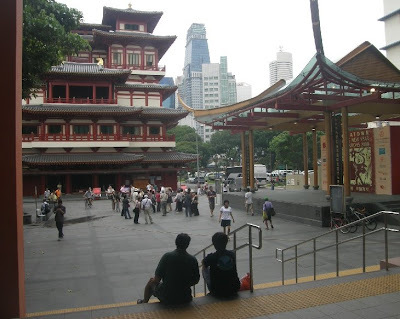 It gave me an opportunity to look around that modern Asian city - especially the waterfront. This montage is from an outside walkway outside a Mall by the waterfront. I'm not especially keen on malls, but the way the design resolutely provided quality public space - while allowing shops of all sorts to operate within the building - was very interesting. These next three pictures give a flavour of the actual waterfront space and design adjacent to the mall building, and also looking back into the shopping area. This next montage (below) shows another example of this spatial approach to development adjacent to the waterfront. 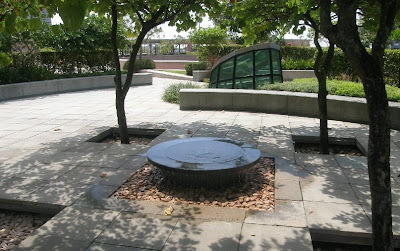 The circular enclosed space is public space. 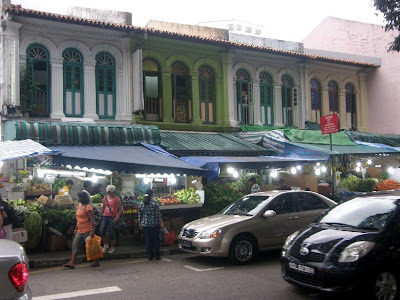 It is very sheltered from prevailing winds, while providing a sort of market square focus for the retail and cafe activities at ground level. There is considerable public space provision on top of this building, and this space is well planted with small trees, gardens and shrubs. The classic green roof - but actually a park, very useable and with great amenity. Stepping through the rooftop garden, you can then view the adjacent waterfront spaces and views. The next montage (below) is from the roof. You can see the carefully designed waterfront spaces and planting. 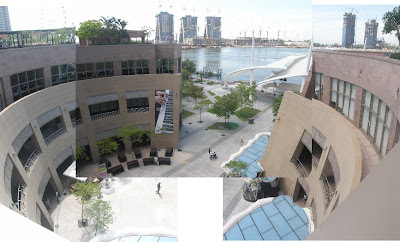 The sail shaded area is a a public performance area - bands and informal concerts occur there. This final montage (below) actually contains 3 shots of the same slice of waterfront space between the built edge, and the water edge. What the photos try to show (!?) 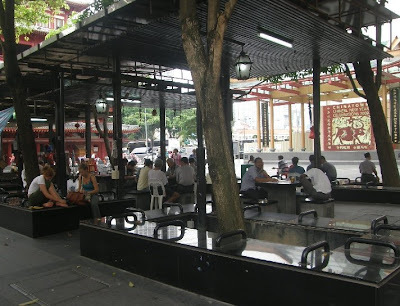 is the fact that there is a public pavement directly adjacent to to the buildings (some of which are activated), then there is a planted strip that contains outdoor restaurant seating and cafes (you can make out the StarBucks umbrellas here), and then there is another wide public pavement. These designs show the kind of approaches that can be adopted to waterfront edges which genuinely respect public space, and provide for successful private business, without getting them all mixed up and in conflict. Profound changes have been proposed to Auckland governance by the Royal Commission. These present severe implementation challenges. The risks of failure outweigh the possible benefits. Toronto is a good example of how long it takes a city to recover from large scale restructuring, and to become effective. The foundation for the Royal Commission recommendations was provided in the ARC’s submission, which was criticised as draconian and failing to either understand or appreciate the role and importance of local government. However the Royal Commission did not consistently adopt the ARC’s idealised model which called for one central authority and about twenty local councils, and which would have necessitated the wholesale abolition and restructuring of Auckland local government. Because of this inconsistency, the Royal Commission’s recommendations are neither one thing nor the other. They fall between the two pillars of local democracy and centralisation. They are severe in their impact and deliver an unbalanced outcome. When the Royal Commission was established the global economy was on a more certain footing than it is now. Today, Auckland and New Zealand are on much more precarious economic terrain. While this uncertainty can present opportunity for change, it also intensifies the risk of failure. Auckland’s economic stability is an essential component of New Zealand’s economic recovery. It would be a major risk to Auckland’s economy and New Zealand for Government to adopt the whole suite of the Royal Commission’s recommendations. A pragmatic and precautionary way forward would be for Government to support some of the Royal Commission’s recommendations. This would be an incremental or staged approach. It would be seen as measured and responsible. This is a short list of high priority improvements which are straightforward to implement with minimum risk of unintended consequences and uncertainty. Manageable Changes and Reforms for Auckland. The following is a summary of practical changes drawn from the report of the Royal Commission that can be implemented now - not without difficulty – and that will have a lasting beneficial effect on Auckland with reduced risk. These changes can be built upon in the future, while having significant utility now. Water & Wastewater: Implement general thrust of Royal Commission recommendations. This includes the transfer all water and wastewater assets to Watercare, along with management responsibilities. Transport: Implement general thrust of Royal Commission recommendations. Community Boards: Same duties as now. These changes by themselves are significant. They will step the Auckland region irreversibly into the sort of future envisaged by the Royal Commission, but not in a way, and at a speed that risks instability and consequent long term damage. Royal Commissars or Royal Commissioners? 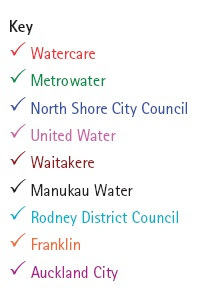 Several quite different political initiatives have led to the New Zealand Government decision that a Royal Commission was needed to: "receive representation upon, inquire into, investigate, and report on the local government arrangements (including institutions, mechanisms, and processes) that are required in the Auckland region over the foreseeable future…"
For example, since 2005, Manukau and Waitakere City Councils have sought to have the powers of the Auckland Regional Council (ARC) reduced in regard to the ARC’s ability to set the Metropolitan Urban Limit (MUL). Frustration at not being able to act independently and rezone rural land for Greenfield development partly inspired the so-called "Auckland Mayoral Coup" in 2006 which was led by all four city mayors, and which sought to replace the elected ARC with themselves, selected businessmen, govt officials and the Minister for Auckland Issues. The mayors proposed a 'Lord Mayor' who was to be elected from across the whole region. Countering this initiative, elected councillors advocating for sustainable development, and seeking compact urban development and more energy efficient land use patterns, called for a stronger and more independent regional government, with the power to implement regional strategies such as the Growth Strategy, the Auckland Sustainability Framework, and the Regional Land Transport Strategy. Business interests in Auckland, frustrated by matters including transport congestion, delays in the completion of the state highway network, and reports about shortages in land supply for commercial development, called for greater involvement in Auckland governance of business leaders. Some went so far as to suggest the whole of Auckland’s local governance should be in the hands of a Commission run by government appointed commissioners. Also in 2006 the Metro Project, run from the ARC’s Auckland Regional Economic Development Office (AREDO), commissioned an International Review Team to undertake a visit and review of Auckland and to comment on a series of background papers prepared for the Metro Auckland Project team. The review partners included Auckland business interests, central government departments, academics, and local government representatives. The "Metro Report" made a number of recommendations relating to Auckland’s governance and other matters that attracted the interest of Central Government. And for the past few years there have been numerous public debates about who should be responsible for the funding and political management of Auckland Philharmonic Orchestra, Motat, and other regional amenities. I'm not going into every last bit here. This is not a comprehensive analysis. But it is a strategic one. First thing that struck me was how wide-ranging the commissioners have gone with their review. Hardly a stone left unturned. For example they are even pulling Government into Auckland with an Auckland Cabinet Committee - apparently essential to the whole thing. The report's Part 3: Vision for Auckland, starts well enough with chapters on vision, economic development, environment, urban design & heritage. But then there's a doozey of a chapter - social wellbeing - that runs for 70 pages. Social well-being makes up half of the Royal Commission's vision for Auckland..... My bet is this is Margaret Bazley's chapter. It's the issue she really went into bat for on radio. I accept that Auckland has social issues, and that it's a tale of several cities, and that Manukau has different issues to deal with than North Shore. I also accept that these differences affect the priorities of each Council. But Central Government and taxation play the main role in health, education and social well-being matters and related service provision. While these matters need to be born in mind for Auckland local government, they are not core local government services. The line needs to be drawn - otherwise we'll all be trying to do everything. Then we get into Part 4: Structural Reform. This part really shows up the weakness or inappropriateness of what the Royal Commission has done. This section sets out the Guiding Principles for Shaping Auckland Governance. These are said to be: common identity and purpose; effectiveness; transparency and accountability; responsiveness. Nowhere a mention of practicality or implementability. And this, I think, is at the heart of why this Royal Commission has served up a crock. Rather than follow the guidance and direction that underpinned its terms of reference, the Royal Commission has gone right back to first principles, it has thrown all of the local government toys out of the cot, and then - from scratch, a tabla rasa approach - tried to put it all back together. But they haven't gone the whole hog - which is what ARC was recommending (and which I strongly opposed, talk about throwing the baby out with the bathwater). They've gone part of the way. The Royal Commission's recommendations fall between the perfect "start from scratch ideal", and the "quick and do-able dirty", and that's why it fail on many counts. Recommendations must pass the test of being practical and implementable. Because this is not a perfect world. That should have been a principle for the Royal Commission. It is astounding to me that it was not. But then we have Part 5: Practical Solutions to Pressing Problems. Sounds good, but it's already too late. Royal Commission had already decided that being practical and putting forward recommendations that passed an implementation test - was not to be on of its principles. It's in Part 5 that we can find the Peter Salmon Chapter, and the David Shand Chapter. The Hon Peter Salmon had a lot to do with crafting the Resource Management Act. Chapter 24 - Planning for Auckland - is RMA specific. It makes no mention of the role of the Local Government Act - which is more about planning for what we do want. It introduces an extremely powerful planning tool called Development Levies. This chapter is written as if the LGA did not exist. It does not do the notion of integrated planning any favours. Also in Part 5 we have what I regard as the David Shand chapter. Chapter 26, The Three Waters. To my eye, this chapter has been pretty much lifted out of his Rating Review report. At 43 pages, it is nearly twice as long as the chapter on transport. Sadly, I couldn't find a chapter that seriously dealt with the pressing issue of how to properly integrate land use and transport planning, and to deliver more sustainable and energy efficient land use development. At page 296 etc, the Royal Commission sweepingly states that "community engagement is poor...". In my experience the best community engagement that I have seen in my 12 years of local government has been driven by community boards. And it has been far from poor. I have written about this elsewhere. I also believe that North Shore City's engagement with its community over the need to clean up its wastewater network and systems, was exemplary. Indeed I am aware that this work has attracted international attention. And based on this sweeping incorrect generalisation, the Royal Commission abolishes Community Boards. I'll leave you to make what you will of the plethora of recommendations made, and the extent to which they match up with the reason Auckland got into this. But I think the Royal Commission took far more rope than was given, Commissioners pursued their own hobby horses individually, and they did not produce a coherent and practical set of implementable recommendations. I just hope that Auckland, and Central Government, are wise enough to ensure that Auckland is not hanged by them.